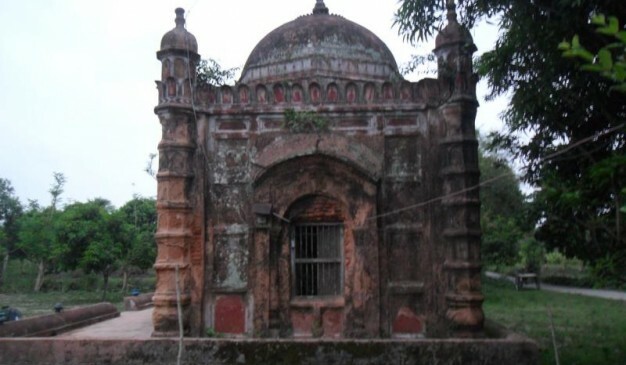 Kismat-Maria Mosque (কিসমত-মারিয়া মসজিদ) is the academic name, where local people knows this as Durgapur mosque (দুর্গাপুর মসজিদ). 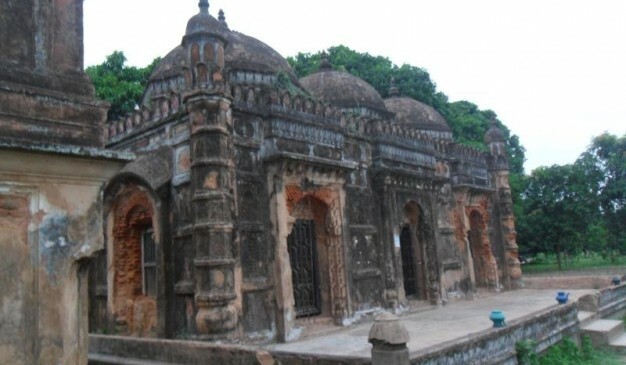 The mosque is located at the Maria (মারিয়া) village, adjacent to village Kismat (কিসমত), that’s why it is called Kismat-Maria Masjid. It is totally unknown about any sort of historical information. No inscription available at the doorway or anywhere. Even the government doesn’t have any document or info regarding this. To add insult to the injury, the local people cannot remember anything about this mosque either. It’s a total mystery. It is certain that the mosque was built several hundred years back. It is having three domes at the top. Four ornate pillars at the four sides of the mosque. Eastern side of the mosque is having three entrances. The mosque is built over a 2-3 feet of high base. 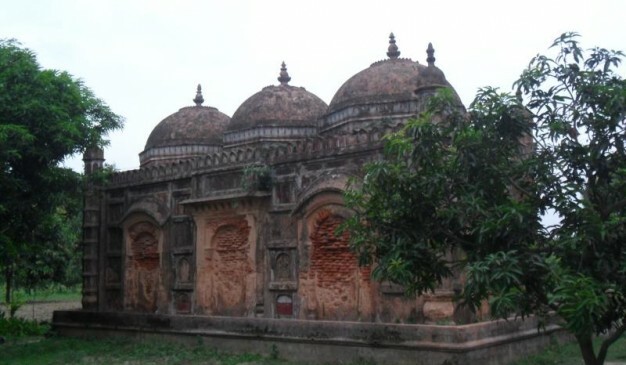 The domes of the mosque is similar to the Kartalab Khan’s Mosque at Old Dhaka. 1) Come to Shibpur Bazar (শিবপুর বাজার) from Rajshahi town. It will be 25-30 minutes of ride using local bus for 10 taka fare. GPS is (24°22’52.71″N, 88°46’12.79″E). 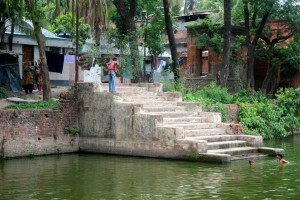 2) Using Tempo/Votvoti (ভটভটি), go to the village Pali (পালি গ্রাম). It will be 5 taka per person. GPS is (24°24’41.52″N, 88°46’43.75″E). 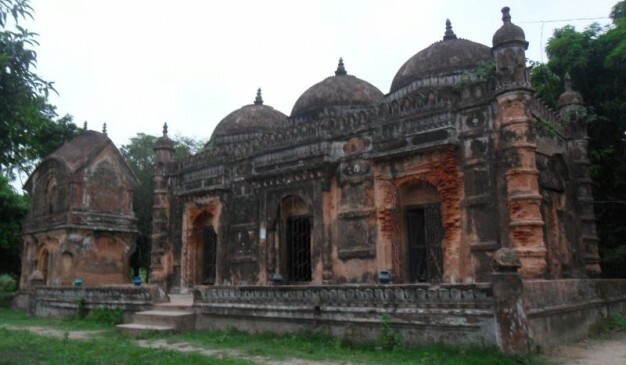 3) From the Pali village (পালি গ্রাম), take a van or similar things to go to the mosque. Better hire the van for round trip, otherwise you have to walk while returning. It is approximately 261 km away from Dhaka. Bus, Train and Air Plane are available as transportation service from and to Rajshahi districts. Transportation in Rajshahi is very good. There is bus service; taxi cabs, three-wheeler auto rickshaw and horse-driven tomtom are available to move within the city. Rajshahi is well connected to the rest of country through roads, air, rail and water. There are two intercity bus terminals in the city. It takes about 5 to 6 hours by road to reach the capital. A number of bus services, including air-conditioned and non-air conditioned buses, are available to and from Dhaka. Bus services to other major cities and district’s headquarter are also available from Rajshahi. Bangladesh Railway’s western zone head office is located in this city. Three Inter-City train services are operated by Bangladesh Railway, named “Silk City Express” “Padma Express” and “Dhumketu Express” between Dhaka and Rajshahi regularly. There are other inter-city, mail and local trains operated from here to connect Khulna city and other part of the country. Shah Makhdum Airport is the primary airport serving the city. It is named after the Islamic preacher Hazrat Shah Makhdum (Rh.) is situated a short distance away from Rajshahi city. Domestic flights from Dhaka and Saidpur are available. NAME OF SERVICE	DEPARTURE TIME	Phone No. Shyamoli Paribahan	05:00AM to 12:00Pm (with every 1 hour interval)	02-900331, 02-8034275. Hotel Red Castle is a nice guest house for accommodation. 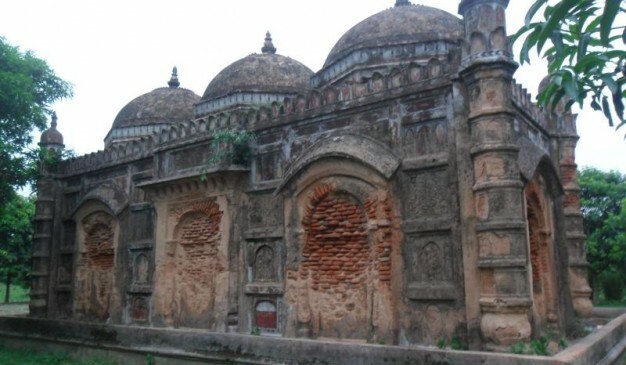 It is situated at the centre point of Rajshahi district. The river Padma is very near from the hotel. Anyone can easily go anywhere in the city from the hotel. Moreover the rent of the hotel is also very cheap. It has 13 rooms in 2 floors. Room Fare: Single A/C BDT 1,000/-, Double A/C BDT 2,200/- to BDT 3,200/- Have to add 15% VAT and 5% Service charge. Address: Serushar Para, College Road, Boalia,Rajshahi. Address: Bir Srestha Captain Mohiuddin Zahangir Sarani, Shiroil, Rajshahi-6100. Porjoton Motel (0721-775237), Hotel al Hasib (Ganokpara, Boalia), Hotel Moon (Shahebbazar, Boalia), Hotel Radar, Hotel hox Inn (Shroil, Boalia, Rajshahi), Hotel Jomjom (Hetmotha, Boalia), Hotel Prince (Ganokpara, Boalia), Hotel Saikat (Laxmipur mor), Islami Abasik Hotel (Laxmipur, Razpara), Hotel Sukanna International (Somobay Super Market), Hotel Nice International (Ganokpara), Hotel Sky (Molopara, Boalia), Hotel Heaven (Sharoil Bazar, Boalia), Hotel Elegent (Ganokpara, Boalia). You need to search for local restaurants nearby. 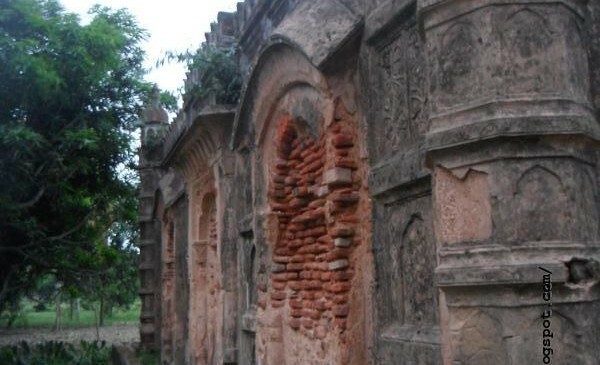 Munshiganj, or Bikrampur as it was formerly known as home to a number of rich landlords and merchants, who lived in palatial houses, built on large estates. Most of these perished in course of time as the mighty Padma River devoured most of Bikrampur. 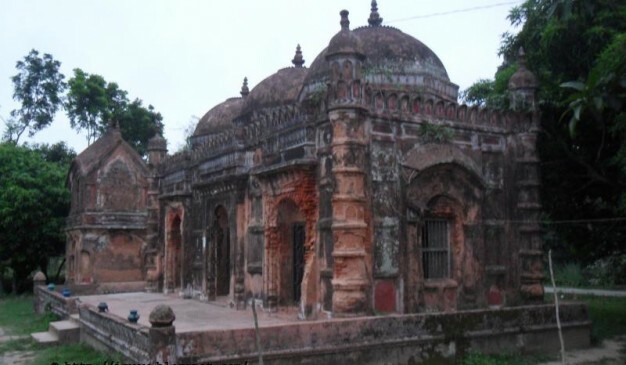 Of all that remain in today’s Munshiganj, the largest is the house at Abdullahpur, known as Tokani Pal House (টোকানী পাল বাড়ি). 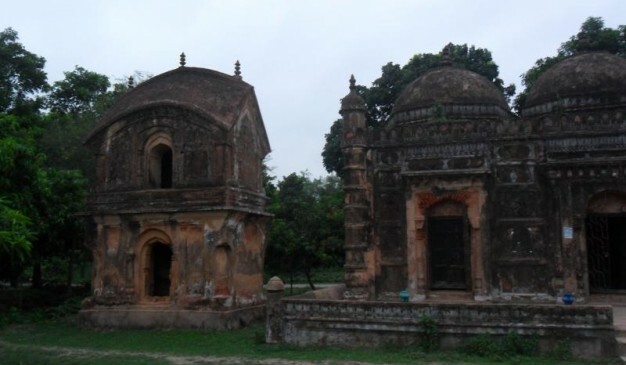 There isn’t enough source to know about who built this house, but Tokani Pal, an elderly merchant from Barisal, bought this 7 acre estate and moved in here sometime in the early 1890s. His second wife Nabanga Sundary and all six sons from his two marriages accompanied him. The estate now consists of 11 buildings and six ponds. The sprawling gardens have hundreds of trees – fruit bearing, medicinal, or for wood itself. And there were once several hundreds of flowering plants. But when Tokani arrived, the estate was in a mess. Kamini Pal, the eldest son of Tokani,took charge of cleaning up the estate. He chose a place to set up a temple, dedicated to Radha-Shyam, of whom they had been followers for generations. By this time, the masons of Abdullahpur had made a name in craftsmanship and expertise, and Arfan Ostagar was the most revered of all. He was hired, for a daily fee of five quarters and a pack of tobacco. His designer had to be paid an additional three quarters. A 15X6 feet room was planned to build, with a wide sprawling varanda, where followers could sing devotional songs every evening. The room would have a large platform, on which would rest a large metal statue of Radha-Shyam. 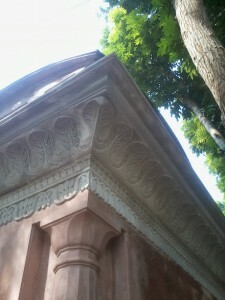 The exterior wall would be decorated with fine ceramic designs. Once completed, the temple became a marvel, people from far and wide came over to see. The Pal’s principal business was surrounded around the Kamala river port of Bikrampur, which was known as the Second Kolkata. Betelnuts, mustard, lentils etc would arrive from Barisal or Chandpur, and would be traded with Kolkata. Almost 20,000 laborers worked daily at this port, where the second largest wholesalers were the Pals. 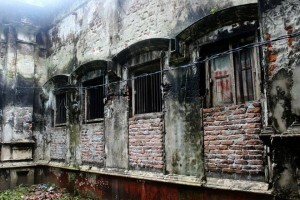 They set up warehouses at places as far as Barisal, Jhalokathhi or Shwarupkathhi, or Chandpur. Kamini Pal also became the most prominent money-lender. Dwarkanath became a prominent dealer in Kerosene oil. Other brothers also chipped in here and there. Business for the Pals was running well. After the Partition of India, a large section of the family moved to Kolkata. Those who remained to protect the family businesses, soon found it difficult, as business with Kolkata became complicated. They had to explore new business avenues, but that wasn’t too easy. In 1971, Hindus were being tortured or killed, their businesses were being shut down, their houses were being torched. The Pal estate being protected with a strong high boundary wall became a safe refuge, not only for members of this family, but for members of extended families, and also for friends and their families. About 500 people had found safe shelter here, until one dark night, when the Pakistani Army entered the compounds, killed several family members, and set the main houses of fire. The entire clan moved to India through Agartala. Almost two years later, Shashadhar Pal, the second son of Dwarkanath Pal, who by then was head of the clan, returned with his family. But by this time major parts of the estate had been grabbed and taken over by others. He tried to revive some of the businesses, but did not quite succeed. His family members went back to Kolkata, but he decided to stay back, reminiscing his childhood memories, and gradually selling off part of their properties. He lived either in one of the houses within this estate, or in the other Pal House, which also was built by his uncle Kamini Pal several decades ago. He passed away in the late 1990s. 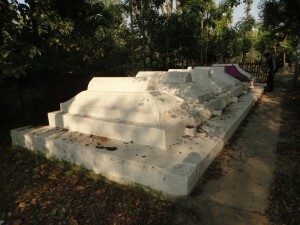 The Niyogi House (নিয়গি বাড়ি) is located at Pukur Para (পুকুর পাড়া) of Singair Upazila. It is a old house built by Ganesh Chandra Niyogi more than 100 years ago. 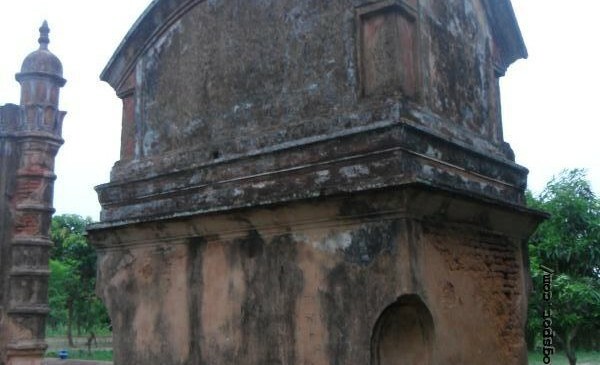 The household comprises of three structures, the principal and largest one is in severe ruins. Not only has the entire roof fallen down, anything that once formed this roof has now disappeared. The large arched doors and windows including their frames too are not to be found anywhere. It had a spacious corridor running the length of the building inside. Another large building, though too in a dilapidated state is currently being used as the hostel of the local college. The smallest structure that once served as the kitchen has been renovated and is currently being used as accommodation by the Head of the Department of Economics of the same institution. He was there to proudly show us around the premises. Within the inner compound of the buildings, there is an old well, which shows more waste than water some fifteen feet below. 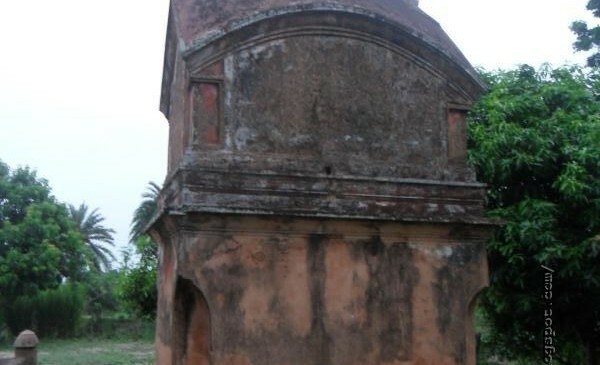 Date inscribed there 1334 Falgun (ফালগুণ) on the wall of this well, declaring this to be at least 87 years old.